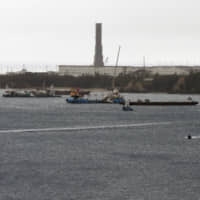 Tensions between the central government and Okinawa rose further on Friday as five vessels were moved into the sea near the Henoko district of Nago, in the north of the prefecture, a key step in the controversial relocation of a U.S. military base within the prefecture. According to Defense Minister Takeshi Iwaya, five vessels, including four sand and earth barges, have been deployed to the sea near Henoko to start reclamation work on Dec 14. 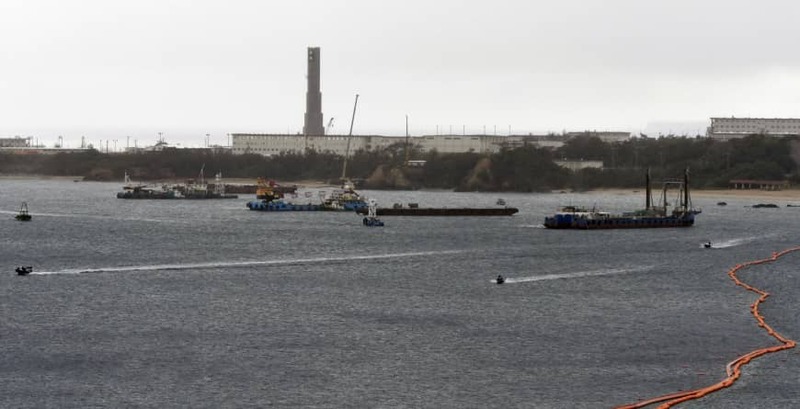 By taking the step, the central government ignored a plea from the Okinawa government calling for reclamation work to be suspended at least until the prefectural government finishes an inspection into a cement company involved in the construction. “We will start throwing in sand and earth (into the sea) on Dec. 14, and there has been no change in that plan,” Iwaya told a news conference in Tokyo on Friday. The relocation project has been delayed for years due to strong opposition from residents of Okinawa, where anti-military sentiment has remained strong due to the memories of fierce ground battles during World War II. The central government has maintained that the relocation of U.S. Marine Corps Air Station Futenma within the prefecture is essential to maintain deterrence for Japan and the region, presumably referring to China’s growing military presence. The Senkaku Islands, which are controlled by Japan but claimed by China, are located within Okinawa Prefecture. The islets are known as Diaoyu in China. The U.S. base is located in the middle of a densely populated area of Ginowan in central Okinawa, and local residents have called for the removal of the base citing noise pollution and the risk of accidents. The central government has tried to promote the relocation plan, but the majority of Okinawa voters have called for the removal of the base or its relocation outside of the prefecture. In September, Denny Tamaki, who is opposed to the relocation of the base within the prefecture, was elected governor, giving another boost to voters who are against the project. But the Cabinet, led by Prime Minister Shinzo Abe, has continued pushing for the move to Henoko, raising tensions with the Okinawa government.